My husband and I have been doing a lot of traveling since he retired. I love to travel–I’ll go almost anywhere. Chuck does most of the planning and has lists of hundreds of destinations he’d like to see. All this travel does, however, wreak havoc with my work, both writing and art. I gain all kinds of inspiration–story ideas, interesting characters, amazing possible settings, and lots more. I gather images through sketching and snapshots. 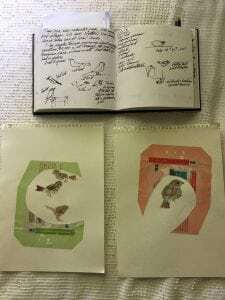 But before I am able to process these ideas and get them down on paper, outside of my journal, we are off again, and I’m inundated with more images, more ideas. The challenge for me is to find a way to work that is flexible and portable. My journal acts as a miniature, mobile studio. I can develop story ideas in my journal. But ultimately, I need a way to develop my art ideas while we are on the road. Here are two studies of chipping sparrows based on sketches out of my journal. I’m thinking of this project as “Birds of My World.” When we travel, I sketch the birds wherever we are. I have been intending to work from these sketches, to create my own sort of portfolio/field guide of the birds I see traveling. Now I think I can bring the tools I need to create these collage-drawings on the road. When we get home I can continue to fill out my own bird portfolio. The paper I am using is Strathmore 400 series drawing paper. The spiral pads come in several sizes, which will allow me to put larger birds on larger sheets of paper. This size, 9″ x 12″, is easy to pack when I travel, and I use found papers and maps salvaged from the location I am in for the collage. The largest pad is 18″ x 24″, too big to transport easily, but handy for larger birds like penguins and gulls. I can work on these in my studio once I get home. I have several goals for this project. One is to create my own “field guide” to the birds I have seen in Africa, South America, Antarctica, anywhere I’ve been lucky enough to travel. I hope that the process of drawing and studying these birds will re-enforce my ability to recognize them and identify them in the field. Another goal is to explore the combination of collage and drawing, to become more free with the materials. In the end, I will be creating my own portfolio, inspired by Audubon, to help me learn to know the birds of my world.